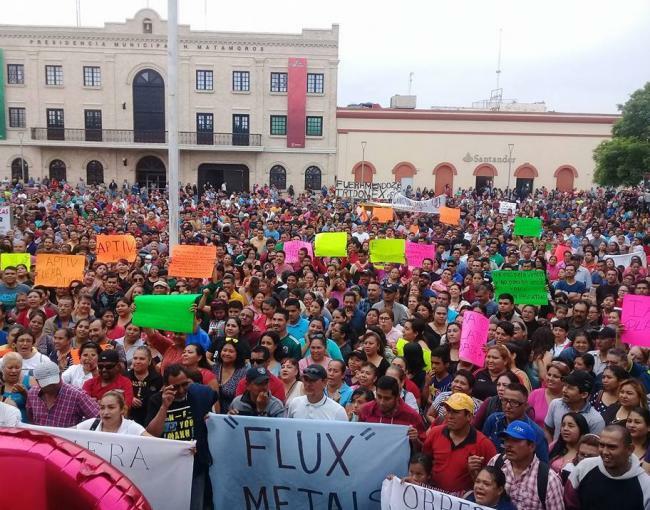 On January 24, forty-five factories in Matamoros, Mexico, a city in the “maquiladora” free trade zone near the border with Texas, went on strike, with over 30,000 workers demanding 20% wage increases, an increase in their productivity bonuses from 3,500 pesos yearly to 32,000 pesos, protection of their benefits, and the democratization of their union. The workers have won their demands in the majority of these cases. As we go to press there are still five factories on strike. The catalyst for these strikes has been the promise by the new left populist Mexican president Andrés Manuel López Obrador (AMLO) to raise the minimum wage in the border region of the country, to which corporations responded with job cuts, the elimination of bonuses and benefits, the denial of obligatory annual pay raises, and various other maneuvers to avoid actually raising the real wages of their employees. These strikes are significant due to their break with the typical corrupt dealings between the leadership of big unions and employers in Mexico, who often collaborate at the expense of workers. The workers in Matamoros are part of the Confederation of Mexican Workers (CTM), the largest union federation in the country, whose leadership unfortunately regularly caves to company demands in the workers’ contract negotiations. Rather than resigning themselves to the concessionary stance of the federation leadership, the workers – using their own independent networks to communicate – instead took determined action and forced the hands of their union leaders to announce their strike as official. Through the process of the workers’ independent organizing, debates have also begun within the union’s ranks about replacing union leaders who do not defend the interests of the working class, requiring that union leaders earn the salary of an average worker, and of the need for truly democratic union elections. The election and promises of AMLO have given confidence to Mexican workers who have taken matters into their own hands. Emboldened by the victories in Matamoros, workers in Sonora, Chihuahua, and Baja California have moved into action as well. These strikes have the potential to continue to spread across the country, as we have seen with the continuing wave of teachers’ strikes in the U.S.